Foot Sweep- This activity was originally developed by Origins as part of the Developmental Designs for Middle School program. 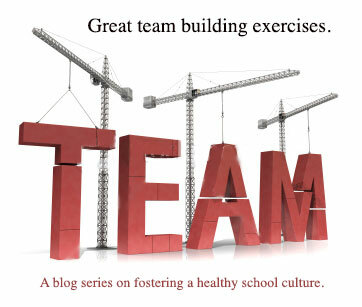 It is another very easy to facilitate team-building activity that provides lots of flexibility on topic focus. The first thing you've got to do is setup the activity area. Choose a medium to large open space (I like gymnasiums and multi-purpose rooms) and identify a starting side and finishing side in the area. Next, grab three to four chairs and have them at your ready after the activity begins. The chairs will act as obstacles around which the participants will have to move. Bring participants to the activity area and tell them the object of the activity will be to move together from one side (the starting side) to the other side (the finishing side) of the space. Then tell them they will all have to reach this goal together. Participants will have to keep their feet together and work to cross the area without disconnecting. In other words, each participant will have to place his/her foot directly beside the foot of the participant beside him/her keep the feet together for the entire exercise. Use the chairs (obstacles) to disrupt the group's movement to the finishing side. I often tape paper with the following titles on the chairs to symbolize the leadership challenges participants may confront: 1. Pressure from the teachers' union. 2. Disagreements with peers. 3. Board of Education influence. A Debrief of this exercise with all the participants can focus on team-work, collaboration, collegiality. The entire activity takes approximately 30 minutes to complete.